Living a Fit and Full Life: The Dreambaby® Royale Converta® 3 in 1 Play-Pen Gate is the Perfect Way to Keep Baby Safe Around the Home! 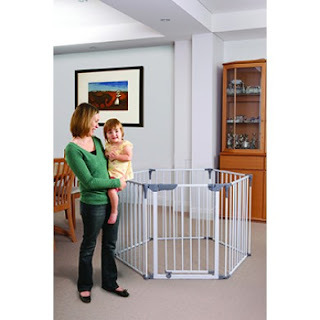 The Dreambaby® Royale Converta® 3 in 1 Play-Pen Gate is the Perfect Way to Keep Baby Safe Around the Home! Our products are designed to not only help make your home safer, but also to make life easier. Our safety locks and latches are available in both screw-in and adhesive options and there is also a Silver Style Range designed to complement modern stainless interiors. You can see just how easy our safety gates, locks and latches are to install by visiting DreambabyTV on YouTube. Constructed from durable, sturdy metal, the play-pen is safe and secure to use, and will last a long time. The panels have secure corner attachments to connect one another, and the compact design allows for them to be stored away easily. The play-pen is portable, which makes it ideal for travelling and using in multiple areas around the home. Dreambaby® Royale Converta® Extensions, this system is the ultimate is care and convenience whilst looking good too! Six individual modular panels creating a wide gate and including a convenient walk through gate. Converts quickly into a six sided play-pen and can also be configured to help block off fire places to small children. 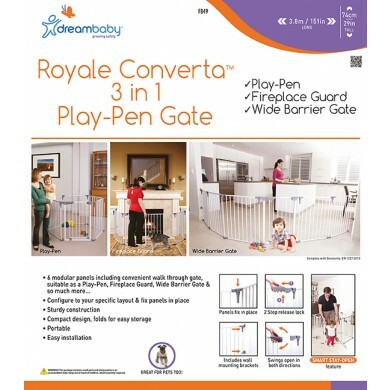 The Dreambaby® Royale Converta® 3 in 1 Play-Pen Gate is the perfect way to keep baby safe around the home! As a mom of 4 I'm absolutely in love with this play-pen. It was extremely easy to set up and keeps my son out of trouble while I'm cooking, cleaning and doing various other household tasks. I have three girls and my son is about a year old, and boy is he a handful. He's into everything so I needed and easy way to contain him and absolutely adore this play pen because it's large enough for him to take enough of his toys to keep him busy and entertained while I get a few things done. Another huge added bonus for me is that his three year old sister loves to go in the Dreambaby® Royale Converta® 3 in 1 Play-Pen Gate and play with him and again because it's so large this works out perfectly. The Dreambaby® Royale Converta® 3 in 1 Play-Pen Gate is made is a high quality play pen and works absolutely wonderfully. I also really like that you can attach it to the wall to place it in front of a fireplace, bookshelf or really anything that you need to keep baby away from. The gate opens with ease which is extremely helpful to this mom of 4 who often has her hands full. Although my girls were pretty easy as babies, I really wish I'd have had something like this for them as it would have saved me so much extra work trying to get things done around the house. I highly recommend this Dreambaby® Royale Converta® 3 in 1 Play-Pen Gate! Click HERE to learn more about Dreambaby! Follow Dreambaby on social media!